What a beautiful day. Determined to make the most of the glorious sunshine, I ventured outside. As I inhaled large lungfuls of fresh air, I noticed a pretty yellow butterfly. Perched on a fox turd. Nice. I could hear the perturbed chickens shouting obscenities at me from the bottom of the garden. Accompanied by the chuffin cat, I went to release them from their coop. As I opened the cage door they looked up at me, squawked and hurtled off onto the lawn. As opposed to the chuffin cat who hurtled headfirst vertically up the nearest tree. I ambled across to him to see what the trouble was. “Every time I move, I get an electric shock” he complained. “Best sit still then, love” I replied with a smile. The poor little chap was having a bad day. He’d already spent half the morning tied to a tree, courtesy of his brothers. Having struggled free, he’d then had a fight with the chuffin cat as she wouldn’t let him play on the slide – she was having far too much fun clambering up and down it and completely refused to take turns. Now this. I left him in his bouncy prison, rocking a funky new static-spiked hair do, and went inside to make a drink. I love a nice cup of tea, particularly Earl Grey … although my family don’t call it that after son no 3 once misheard the name, causing much hilarity: he thought it was called ‘Old Gay’ and the name stuck. I looked through the window to see the chuffin cat was now playing hide and seek with the chickens. Well, she was hiding, they were seeking. A large crow suddenly landed in the garden, a menacing gleam in his eye. He didn’t stay for long – who chased him away? Yes, that’s right: Cobweb Gladys the small white hen, whilst the chuffin cat bravely cowered behind a blade of grass. I brought my cup of ‘Old Gay’ outside and wandered towards a garden chair. The chickens instantly spied me and came running full pelt, their little spindly legs working hard as their fat, feathered bodies waddled from side to side. I placed my cup on the ground and they took it in turns to peer impertinently at the tea. Much to my annoyance, a small black fly decided to nosedive directly into my cup. In a frenzy, Cobweb Gladys plunged her beak into the hot tea. It didn’t stay there long: she shook her head in a stupor, knocking the cup and spilling the entire contents all over the grass. Not to be outdone, Doris DooDah decided her errant sister should lose her ‘Head Chicken’ status at that precise moment, and she launched a full scale mutiny. 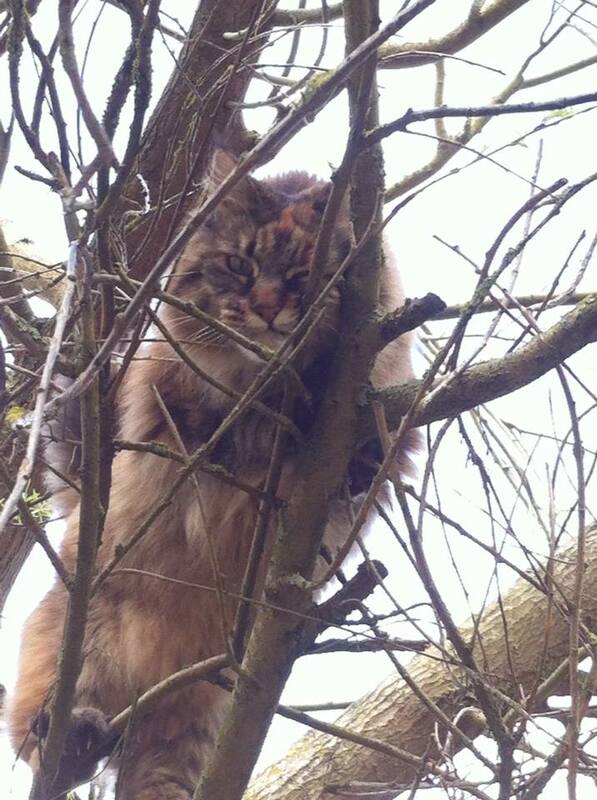 The chuffin cat hit major panic mode and shot up the apple tree, her claws splintering on the trunk in her haste to escape. There she remained, shouting loudly as if to provide a running commentary on the battle unfolding below her. I sighed in frustration. How could a simple cup of ‘Old Gay’ have turned an idyllic afternoon into a scene from Gladiator? Son no 3 appeared, evidently having managed to extricate himself from his static cell. “Mum, I’m hungry. What’s for tea?” he asked. The chickens were revolting. Not in the sense that they smelt rancid, well not on a good day anyway. No, they were causing a riot down in the chicken coop. Upon further investigation I discovered the reason for their rumpus: their food bowl contained a large pile of dust. Son no 2 had been tasked with tending them for a couple of days, but he had clearly been feeding them the dregs from the bottom of the bag of pellets. Cobweb Gladys inspected the bowl of dust, then glared at me in disgust. Doris DooDah let out a melancholy <cluck> and shuffled off to sit on the perch in a despondent heap. 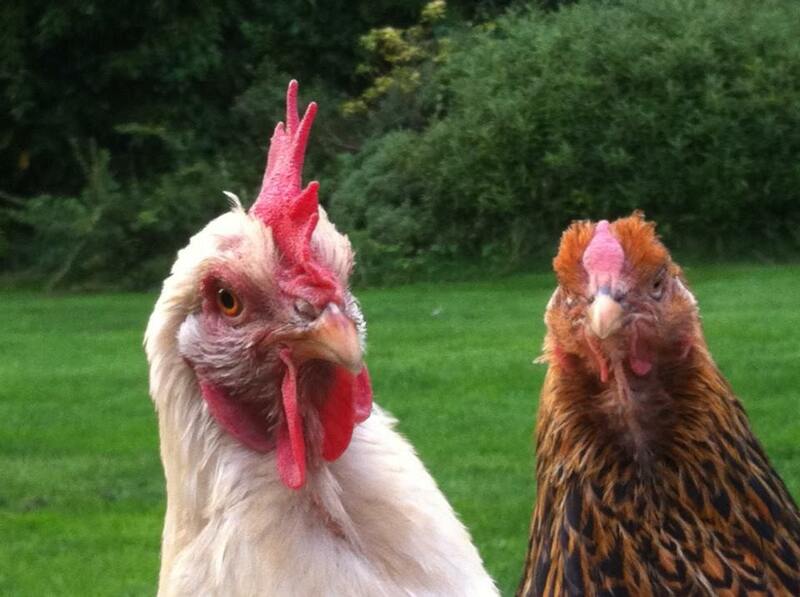 The chickens glanced at each other and together let out the avian equivalent of a very loud ‘tut’. If they could have rolled their eyes, that would have followed. Cobweb went to join her sister on the perch and there they sat, a perturbed pile of plumage, eyeing me in an accusatory fashion. Feeling rather guilty, I grabbed sons no 2 and 3, jumped in the car and we shot off to Pets at Home. Ah the fun to be had at a pet superstore. The chicken food was soon forgotten as the boys became engrossed in 4 caged degus, fighting it out on a large wheel to see who could stay on it the longest. Their little beady eyes glistened as their furry bodies heaved and shoved, legs going like the clappers. So this is what a wrestling match would look like if the men wore furry bodysuits rather than lycra unitards. Marvellous. “Please can we get some?” asked son no 3, hope shining from his big blue eyes. The boys sighed and carried on moseying round the shop. Son no 3 ran across to have a look, then recoiled in disgust: his brother had discovered an entire shelf packed with plastic tubs which contained live crickets. I shook my head, trying to suppress a smile. “If they’re not pets, then why do people buy them?” questioned son no 3. “For food,” I replied absent mindedly. The boys could hardly contain their disappointment as I threw a sack of chicken food their way and made my way to the till to pay. So what have I learnt today? 1. Chickens might bathe in dust, but they won’t eat it. 2. Degus put on free wrestling matches to endear themselves to boys. 3. It might be worth buying some half price crickets, to try and increase son no 3’s protein level.